• Hardware for Metpar metal or laminate toilet partitions. • Parts work the same as those used by the manufacturer. Chrome plated; supplied with mounting screws. Top hinge for metal toilet partitions. For 1-1/4" round edge pilaster. 1-1/2" between screw centers. Used by Metpar and AMPCO. Bottom hinge for metal toilet partitions. For 1-1/4" round edge pilaster. 1-1/2" between screw centers. Used by Metpar and AMPCO. Top hinge pin for Metpar or AMPCO metal toilet partitions. Threaded steel 3/8" diameter x 3" long. Cam and pintle assembly for Metpar metal toilet partitions. Top hinge door insert for metal toilet partitions with 1" thick round edge door. For unplated/unpainted finish, select part number C3513. For bright chrome finish, select part number C3513BC. Used by Metpar and AMPCO. 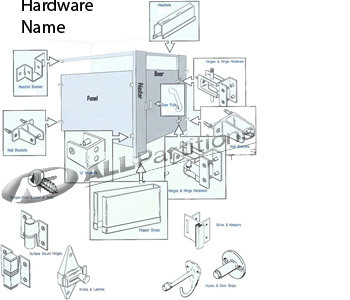 Bottom hinge door insert for metal partitions with 1" thick round edge door. For unplated/unpainted finish, select part number C0140. For bright chrome finish, select part number 1005BC. Used by Metpar and AMPCO. Rectangular concealed latch for Metpar metal toilet partitions. Round concealed latch knob and cover set for Metpar metal toilet partitions. Round concealed ADA handicapped latch knob and cover set for Metpar metal toilet partitions. For 1-1/4" thick round edge pilaster. Used on Metpar metal partitions with flat concealed latch slide pin. For inswing or outswing doors. Top hinge for Metpar plastic laminate toilet partitions. For 1-1/4" thick square edge pilaster. Bottom hinge for Metpar plastic laminate toilet partitions. For 1-1/4" thick square edge pilaster. Top hinge pin for Metpar plastic laminate toilet partitions. Knurled steel 3/8" diameter x 3-1/2" long. Bottom hinge nylon cam for Metpar plastic laminate toilet partitions. Round for 1/2" pintle. Bottom hinge pintle for Metpar plastic laminate toilet partitions. 1/2" diameter. Bottom door insert for Metpar plastic laminate toilet partitions. For 7/8" thick square edge door. Top door insert for Metpar plastic laminate toilet partitions. For 7/8" thick door.